This is a five-part series of articles that aims to introduce football coaches and fanatics to basic concepts in a systems football approach (such as tiki-taka). The systems approach to football is founded upon a system of complexity and unity. Part three of this series promised an illustrative insight into the defensive components that make up a successful systems football approach. In truth, each part of this series of articles are overlapping and interlinked since the pertinent approach is one that advocates an approach of ‘oneness’ and ‘wholeness’. It would therefore be both difficult and impractical to isolate the component of defending in a systems approach without linking defending with each and every aspect of the system. In both approaches of totaal-voetbal and tiki-taka, it is likely that the possession statistics will be balanced in your favour; therefore, the way in which you think about defending needs to be altered. This article will cover three aspects of defensive thinking in a system’s approach: movement, pressing and compaction. At the end of the article will be some general advice from the professionals (Ashley Cole, Michael Carrick…) about how to deal with your opponents. It is important to remember that whilst systems football is an approach that finds the middle ground between science and art, the components when broken down are not alien to us as knowledgeable football analysts. But, it is the way they are packaged and formed together as one single approach that intrigues us. 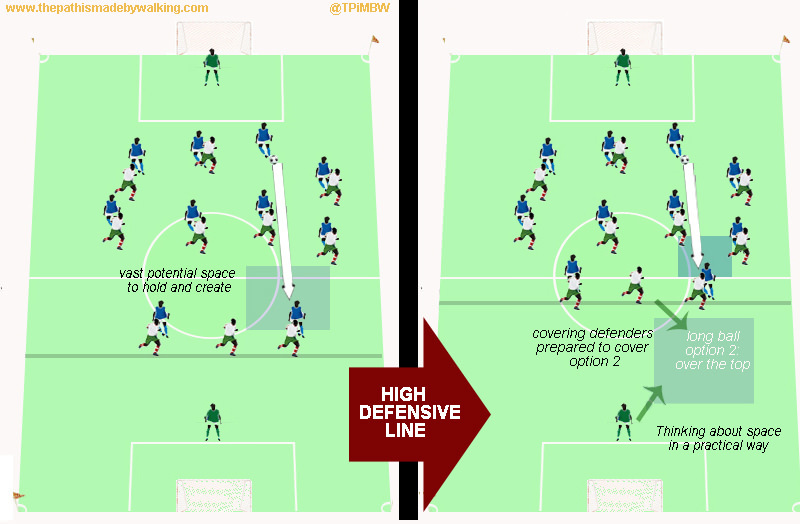 As always it would be impossible to cover everything concerning defending in a systems approach; however, this article has picked out three of the most important aspects of defending in a systems approach. Please find links to part’s one and two at the end of this post if you are yet to read them. In the Ajax model and formation from week two a flexible formation was presented to you (3-4-3/4-3-3 and so on) just by moving two players. However, in the Barcelona model it is not the centre back who becomes a midfielder, but the contrary as a midfielder becomes a libero and the full backs become midfielders in the change over of possession. The model aims that your team is to have more possession (65%+ in most cases), therefore players roaming forward is not nearly as risky as it would be in a more balanced match of possession, even so – the roaming forward must be a calculated and controlled one. Never reckless. The defensive midfielder drops back and becomes a central defender, the free man who is able to act as a covering and ball playing defender. The two existing central defenders are the marking conscious defenders. The full backs push on into the space created as the inside forwards move inside, taking their markers with them (re: week two’s concept of off ball movement to create space). This of course is all theoretical and in practice the controlled surge forward will be a purposeful and concentrated one (down the left or right). Week two’s training exercise illustrated how third-man running is imperative to quick and precise passing. The concept of ‘found-space’ is easily created for full backs to run into and is one that Barcelona capitalise on time and time again. In the Ajax model Rijkaard played as a centre back turned defensive midfielder when possession was won. However, Barcelona’s model is exactly as shown in the animation. Busquets drops into the centre of defence, while Puyol and Pique spread into wide positions while Barcelona are in possession, often right out onto the touchlines to create space for themselves and give the oppositions attackers the headache of either pressing out of position on the wing or allowing them the space. The two full backs are then fully covered and enabled to drive forward into the found space and compacts the play higher up the field. Carlos Alberto (1970) for Brazil was given the freedom to roam forward as Everaldo, on the opposite flank, tucked in and became the third centre back. But in more recent years it has not been uncommon for both full backs to take a Carlos Alberto stance on attacking movement. Jorginho and Branco, Thuram and Lizarazu, Cafu and Roberto Carlos, Zambrotta and Grosso, Anyukov and Zhirkov and so on. A study in 1988 of 16 international matches showed that possession was won 13% of the time in the attacking third. A staggering 66% of goals scored were from this 13%. The art of pressing was a concept widely recognised after Valeriy Lobanovskyi’s book ‘The Methodological Basis of the Development of Training Models’. In his study Lobanovskyi recognised that there were three different types of pressing in football: full-pressing, half-pressing and false-pressing. However, successful sides coordinate and utilise all three. Full-pressing is the most widely recognised aspect of pressing, whereby the opponents are under pressure and aggressively hunted deep in their own half. Half-pressing only comes into practice when the opponents cross the half way line and false-pressing is when a team pretends to press. To pretend to press is to have one player close down the player in possession, while the others sit off. The theory behind this is that the mistakes are still caused despite not full-pressing. Lobanovskyi would often instruct his team to work in phrases of all three. To full-press early on and then completely switch to false-pressing to throw the opponents and still induce the key error. Through compacting the play whilst in possession, a defensive ploy is intertwined with an attacking strategy. 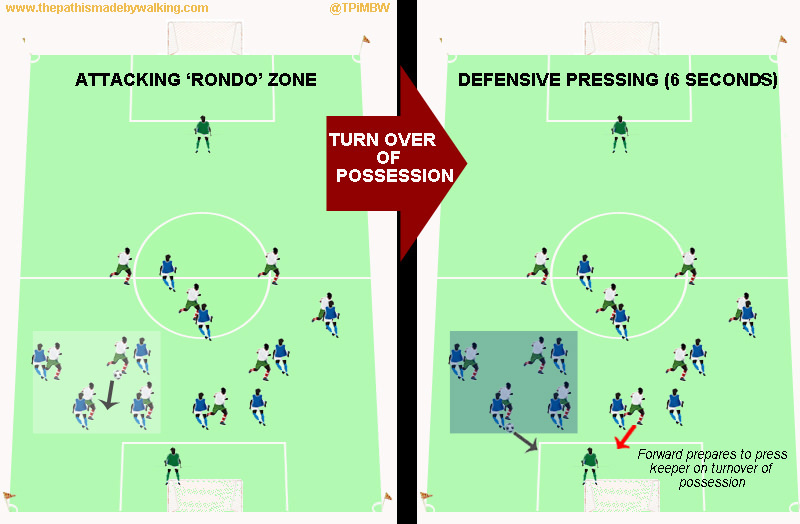 As the team move forward in possession and compact into a ‘rondo-style’ (week one) zonal approach to possession, the players are already in place in the event to lose the ball to act quickly and immediately press in these same dangerous zones. On winning the ball back, the players are already in perfect position to begin the process of picking at the lock once again. In the diagram above the two world’s of attacking and defending merge together. The theoretical scenario shows that in such an approach, a ‘whole’ systems approach, you simply cannot attack without thinking about defending; just as the defensive forward movement shows you cannot defend without thinking about attacking. As the play is compacted into the right-wing zone, players are playing in a rondo-like manner, one which will have been well-practiced in training and therefore, an uncomfortable scenario that is made comfortable to the team in possession. In the event the ball is lost (to the oppositions left back in the scenario), as stated already, the players are already perfectly placed to press and force an immediate error. The left back is left with kicking the ball out of play and playing the ball back to a keeper; in which case the forward is awaiting for the predicted pass, to pounce and press. The keeper will then have no time to pick out a pass and usually will resort to kicking the ball out of play or a long ball played forward; the striker is then out numbered by the defenders left around him. Rodgers, like Guardiola implements a six second rule whereby the opponents are most vulnerable in possession. Six seconds to force an error and win the ball back. A six second hunt to smother the ball. If the ball is not won back within this time zone and it is no longer appropriate to use this approach, the team must fall back and perform a controlled press as a singular unit. There are then triggers for when to press, so the team knows when to do this together, as one. Devastatingly coordinated. A coalition between eleven players. One of these triggers is highlighted in the scenario given, a player wins the ball and then turns back to goal. In doing this, the defender has narrowed down his options to only pass the ball back as the players immediately are in place to not allow the defender the opportunity to turn. The second is when the opponents takes a bad touch, an uncontrolled one. The opponent will then need to look down to relocate the ball; thus losing sight of the field around him for those few seconds. It’s those first few seconds that matter most, in your survival of the perfect full-pressing approach. I warned you didn’t I, of the overlap in trying to isolate the details of a systems approach. Through the defensive movement forward into selected areas, the rondo-like approach in small zones and the possibility of an aggressive immediate press many of the benefits of player compaction has been made obvious in how to both defend and attack, since they are simply ‘almost’ the same thing. However, to highlight the importance in compacting a deep defensive line closer to the midfield two juxtaposing diagrams has been provided below. By pressing high you have reduced the amount of space available to the target man. The long ball is often played to play out of high pressure situations or to try to find a winner in the dying minutes of the game. If the defence sits deep, then the vast amount of space available to the forward, should he win the ball and gain control, enables the forward to hold up the ball and play in a midfielder driving forward. This may well be true, but Guardiola, Lobanovskyi, Michels et al. clearly believe that every player on the team is a defender and every player on the team is an outlet when in possession. This ties in nicely with the concept of being in control of the situation despite not being in possession. You cut the action-reaction time by doing just as Carrick suggests; but allowing the opponent to see the space that you know he is about to go into and be confident that you are quick enough to beat him to the ball in this space. It is also true that teams often force opponents down the flanks as crossing rates are normally around the 20% mark in terms of their success rates; a far lower success rate than that of a through ball in a dangerous central position. The logic is simple. NOTE: sign up to www.thepathismadebywalking.com’s free newsletter to be the first to be the first to know when the Tiki-Taka Handbook is to be released: a coaching handbook accompanied with explanatory purpose designed training sessions (all versions: ebook etc) and 11 diagrammatic player handbooks (hard copy only). Categories: Arsenal (NN), Aston Villa (NN), Blackburn Rovers, Bolton Wanderers, Chelsea (NN), EPLIndex Tactical Report, Everton (NN), Fulham (NN), Liverpool (NN), Manchester City (NN), Manchester Utd (NN), Newcastle Utd (NN), Norwich City (NN), QPR (NN), Reading (NN), Southampton (NN), Stoke City (NN), Sunderland (NN), Swansea City (NN), Tottenham Hotspur (NN), West Bromwich Albion (NN), West Ham United (NN), Wigan (NN), and Wolves (NN).' 'Tags: 5 second rule, 6 second rule, ajax, analysis, Anyukov and Zhirkov, Approach, Ashley, asissts, Brendan Rodgers Tactics, cafu, Cafu and Roberto Carlos, carlos, Carlos Alberto, Carrick, centre back, change, coaching, Cole, Cryuff, Dani Alves, Defence, defensive line, Everaldo, football, formation, full back, Guardiola, jack charlton, Jed Davies, Jorginho and Branco, left back, Libero, Liverpool (NN), Lobanovskyi, Possession, pressing, quote, Right Back, Rijkaard, rinus michels, rodgers, soccer, spain, Swansea, Sweeper, System, tactical, tactics, The Path is Made By Walking, thepathismadebywalking, Thuram and Lizarazu, Tiki Taka, Total Football, TPiMBW, villarreal, Wenger, wing, Zambrotta and Grosso, and zone. Brendan Rodgers’ Tactical Approach: How Liverpool adapt to Tiki-Taka?